Definition at line 77 of file llvfs.h. Definition at line 151 of file llvfs.h. Definition at line 153 of file llvfs.h. Definition at line 148 of file llvfs.h. Definition at line 235 of file llvfs.cpp. References addFreeBlock(), LLAssetType::AT_COUNT, LLAssetType::AT_NONE, count, LLVFSFileBlock::deserialize(), end, FALSE, LLFile::fopen(), i, llendl, llerrs, llinfos, llwarns, LLVFSBlock::locationSortPredicate(), lockData(), mDataFilename, mDataFP, mDataMutex, mFileBlocks, LLVFSFileSpecifier::mFileID, LLVFSFileSpecifier::mFileType, mIndexFilename, mIndexFP, mIndexHoles, LLVFSFileBlock::mIndexLocation, LLVFSBlock::mLength, LLVFSBlock::mLocation, mLockCounts, mReadOnly, mRemoveAfterCrash, LLVFSFileBlock::mSize, mValid, NULL, openAndLock(), presizeDataFile(), LLFile::remove(), S32, LLVFSFileBlock::SERIAL_SIZE, LLFile::stat(), sync(), TRUE, unlockAndClose(), unlockData(), VFSLOCK_COUNT, VFSVALID_BAD_CANNOT_CREATE, VFSVALID_BAD_CANNOT_OPEN_READONLY, VFSVALID_BAD_CORRUPT, and VFSVALID_OK. Definition at line 615 of file llvfs.cpp. References LLMutex::isLocked(), llendl, llerrs, mDataFilename, mDataFP, mDataMutex, mFileBlocks, mFreeBlocksByLength, mFreeBlocksByLocation, mIndexFilename, mIndexFP, mReadOnly, mRemoveAfterCrash, NULL, LLFile::remove(), and unlockAndClose(). Definition at line 1336 of file llvfs.cpp. 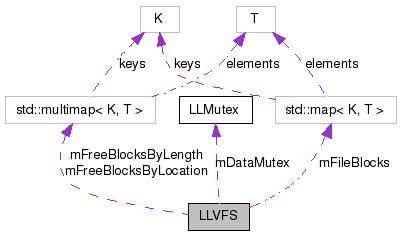 References eraseBlock(), eraseBlockLength(), llendl, llerrs, mFreeBlocksByLength, mFreeBlocksByLocation, LLVFSBlock::mLength, LLVFSBlock::mLocation, and NULL. Referenced by LLVFS(), removeFileBlock(), setMaxSize(), and useFreeSpace(). Definition at line 1725 of file llvfs.cpp. References LLAssetType::AT_COUNT, LLAssetType::AT_NONE, LLVFSFileBlock::deserialize(), FALSE, llendl, llinfos, llwarns, LLVFSFileBlock::mAccessTime, mDataFP, mDataMutex, mFileBlocks, LLVFSFileSpecifier::mFileID, LLVFSFileSpecifier::mFileType, mIndexFP, LLVFSFileBlock::mIndexLocation, LLVFSBlock::mLength, LLVFSBlock::mLocation, LLVFSFileBlock::mSize, LLUUID::null, NULL, S32, LLVFSFileBlock::SERIAL_SIZE, TRUE, and unlockAndClose(). Definition at line 768 of file llvfs.cpp. References FALSE, mFreeBlocksByLength, and TRUE. Definition at line 1868 of file llvfs.cpp. References LLAssetType::AT_COUNT, LLAssetType::AT_NONE, llassert, llendl, llinfos, llwarns, lockData(), mFileBlocks, mIndexHoles, LLUUID::null, S32, and unlockData(). Definition at line 1251 of file llvfs.cpp. References llendl, llwarns, lockData(), mFileBlocks, mLockCounts, and unlockData(). Referenced by LLVFSThread::Request::finishRequest(), LLVFile::rename(), and LLVFile::~LLVFile(). Definition at line 2099 of file llvfs.cpp. References BLOCK_LENGTH_INVALID, get_extension(), getData(), ll_apr_file_open(), ll_apr_file_write(), LL_APR_WB, llendl, llinfos, lockData(), mFileBlocks, S32, size, type, and unlockData(). Definition at line 1895 of file llvfs.cpp. References i, llendl, llinfos, mLockCounts, S32, and VFSLOCK_COUNT. Definition at line 1704 of file llvfs.cpp. References end, llendl, llinfos, mFileBlocks, and mFreeBlocksByLocation. Definition at line 1904 of file llvfs.cpp. References BLOCK_LENGTH_INVALID, end, f, LLAssetType::getDesc(), llendl, llformat(), llinfos, llwarns, lockData(), mFileBlocks, mFreeBlocksByLength, mFreeBlocksByLocation, LLVFSBlock::mLength, LLVFSBlock::mLocation, S32, size, and unlockData(). Definition at line 1325 of file llvfs.cpp. References eraseBlockLength(), llverify, mFreeBlocksByLocation, and LLVFSBlock::mLocation. Referenced by addFreeBlock(), and useFreeSpace(). Definition at line 1298 of file llvfs.cpp. References end, llassert, llendl, llwarns, mFreeBlocksByLength, LLVFSBlock::mLength, and S32. Referenced by addFreeBlock(), and eraseBlock(). Definition at line 1563 of file llvfs.cpp. References dumpLockCounts(), f, FALSE, LLTimer::getElapsedTimeF32(), isValid(), llendl, llerrs, llinfos, llwarns, mFileBlocks, LLVFSFileSpecifier::mFileID, LLVFSFileSpecifier::mFileType, mFreeBlocksByLength, LLVFSBlock::mLength, NULL, removeFileBlock(), S32, TRUE, VFS_CLEANUP_SIZE, VFSLOCK_APPEND, VFSLOCK_OPEN, and VFSLOCK_READ. Definition at line 1087 of file llvfs.cpp. References FALSE, isValid(), llassert, llendl, llerrs, llwarns, lockData(), mDataFP, mFileBlocks, NULL, S32, TRUE, and unlockData(). Referenced by dumpFiles(), and LLVFSThread::Request::processRequest(). Definition at line 689 of file llvfs.cpp. References FALSE, isValid(), llendl, llerrs, lockData(), LLVFSFileBlock::mAccessTime, mFileBlocks, LLVFSBlock::mLength, NULL, TRUE, and unlockData(). Referenced by LLAssetStorage::getEstateAsset(), LLAssetStorage::getInvItemAsset(), LLAssetStorage::hasLocalAsset(), LLAudioEngine::hasLocalFile(), LLAssetUploadResponder::LLAssetUploadResponder(), LLXfer_VFile::startSend(), and LLViewerAssetStorage::storeAssetData(). Definition at line 742 of file llvfs.cpp. References isValid(), llendl, llerrs, lockData(), mFileBlocks, NULL, S32, size, and unlockData(). Referenced by LLVFile::getMaxSize(), and LLVFSThread::Request::Request(). Definition at line 715 of file llvfs.cpp. Definition at line 85 of file llvfs.h. Definition at line 1225 of file llvfs.cpp. References BLOCK_LENGTH_INVALID, lockData(), LLVFSFileBlock::mAccessTime, mFileBlocks, mLockCounts, LLVFSFileBlock::mLocks, NULL, and unlockData(). Referenced by LLVFile::LLVFile(), LLVFile::rename(), and LLVFSThread::Request::Request(). Definition at line 1275 of file llvfs.cpp. References FALSE, lockData(), mFileBlocks, and unlockData(). Definition at line 84 of file llvfs.h. Referenced by findFreeBlock(), getData(), getExists(), getMaxSize(), getSize(), init_cache(), pokeFiles(), removeFile(), renameFile(), setMaxSize(), storeData(), and sync(). Definition at line 2074 of file llvfs.cpp. References BLOCK_LENGTH_INVALID, get_extension(), LLAssetType::getDesc(), llendl, llinfos, lockData(), mFileBlocks, S32, size, and unlockData(). Definition at line 142 of file llvfs.h. Referenced by checkMem(), decLock(), dumpFiles(), dumpStatistics(), getData(), getExists(), getMaxSize(), getSize(), incLock(), isLocked(), listFiles(), LLVFS(), removeFile(), renameFile(), setMaxSize(), storeData(), and sync(). Definition at line 2137 of file llvfs.cpp. References LLFile::_fsopen(), LLFile::fopen(), and NULL. Definition at line 1670 of file llvfs.cpp. References isValid(), llendl, llerrs, llwarns, mDataFP, and mIndexFP. Definition at line 662 of file llvfs.cpp. References llendl, llerrs, llinfos, llwarns, mDataFP, mIndexFilename, LLFile::remove(), and S32. Definition at line 1058 of file llvfs.cpp. References isValid(), llendl, llerrs, llwarns, lockData(), mFileBlocks, mReadOnly, removeFileBlock(), and unlockData(). Referenced by LLVFile::remove(), LLUpdateTaskInventoryResponder::uploadComplete(), and LLUpdateAgentInventoryResponder::uploadComplete(). Definition at line 1036 of file llvfs.cpp. References addFreeBlock(), BLOCK_LENGTH_INVALID, LLVFSFileBlock::mIndexLocation, LLVFSBlock::mLength, LLVFSBlock::mLocation, LLVFSFileBlock::mSize, sync(), and TRUE. Referenced by findFreeBlock(), removeFile(), and renameFile(). Definition at line 969 of file llvfs.cpp. References i, isValid(), llendl, llerrs, lockData(), mFileBlocks, mReadOnly, NULL, removeFileBlock(), S32, sync(), and VFSLOCK_COUNT. Referenced by LLVFSThread::Request::processRequest(), LLVFile::rename(), and LLAssetUploadResponder::result(). Definition at line 774 of file llvfs.cpp. References addFreeBlock(), LLAssetType::AT_TEXTURE, dumpStatistics(), FALSE, FILE_BLOCK_MASK, findFreeBlock(), isValid(), llendl, llerrs, llwarns, lockData(), LLVFSFileBlock::mAccessTime, mDataFP, mFileBlocks, mFreeBlocksByLocation, LLVFSBlock::mLength, LLVFSBlock::mLocation, mReadOnly, LLVFSFileBlock::mSize, NULL, S32, sync(), TRUE, unlockData(), and useFreeSpace(). Definition at line 1136 of file llvfs.cpp. References BLOCK_LENGTH_INVALID, isValid(), llassert, llendl, llerrs, llformat(), llwarns, lockData(), mDataFP, mFileBlocks, mReadOnly, NULL, S32, sync(), and unlockData(). Definition at line 1478 of file llvfs.cpp. References BLOCK_LENGTH_INVALID, FALSE, isValid(), llendl, llerrs, llwarns, lockData(), mIndexFP, mIndexHoles, LLVFSFileBlock::mIndexLocation, LLVFSBlock::mLength, mReadOnly, LLVFSFileBlock::SERIAL_SIZE, LLVFSFileBlock::serialize(), TRUE, and unlockData(). Referenced by LLVFS(), removeFileBlock(), renameFile(), setMaxSize(), and storeData(). Definition at line 2195 of file llvfs.cpp. Referenced by audit(), LLVFS(), and ~LLVFS(). Definition at line 143 of file llvfs.h. Referenced by checkMem(), decLock(), dumpFiles(), dumpStatistics(), getData(), getExists(), getMaxSize(), getSize(), incLock(), isLocked(), listFiles(), LLVFS(), removeFile(), setMaxSize(), storeData(), and sync(). Definition at line 1457 of file llvfs.cpp. References addFreeBlock(), eraseBlock(), LLVFSBlock::mLength, and LLVFSBlock::mLocation. Definition at line 162 of file llvfs.h. Referenced by LLVFS(), and ~LLVFS(). Definition at line 156 of file llvfs.h. Referenced by audit(), getData(), LLVFS(), pokeFiles(), presizeDataFile(), setMaxSize(), storeData(), and ~LLVFS(). Definition at line 146 of file llvfs.h. Referenced by audit(), LLVFS(), lockData(), unlockData(), and ~LLVFS(). Definition at line 149 of file llvfs.h. Referenced by audit(), checkMem(), decLock(), dumpFiles(), dumpMap(), dumpStatistics(), findFreeBlock(), getData(), getExists(), getMaxSize(), getSize(), incLock(), isLocked(), listFiles(), LLVFS(), removeFile(), renameFile(), setMaxSize(), storeData(), and ~LLVFS(). Definition at line 152 of file llvfs.h. Referenced by addFreeBlock(), checkAvailable(), dumpStatistics(), eraseBlockLength(), findFreeBlock(), and ~LLVFS(). Definition at line 154 of file llvfs.h. Referenced by addFreeBlock(), dumpMap(), dumpStatistics(), eraseBlock(), setMaxSize(), and ~LLVFS(). Definition at line 161 of file llvfs.h. Referenced by LLVFS(), presizeDataFile(), and ~LLVFS(). Definition at line 157 of file llvfs.h. Referenced by audit(), LLVFS(), pokeFiles(), sync(), and ~LLVFS(). Definition at line 159 of file llvfs.h. Referenced by checkMem(), LLVFS(), and sync(). Definition at line 167 of file llvfs.h. Referenced by decLock(), dumpLockCounts(), incLock(), and LLVFS(). Definition at line 163 of file llvfs.h. Referenced by LLVFS(), removeFile(), renameFile(), setMaxSize(), storeData(), sync(), and ~LLVFS(). Definition at line 168 of file llvfs.h. Definition at line 165 of file llvfs.h. Referenced by getValidState(), isValid(), and LLVFS().